The former basketball player wants President Donald Trump to let him speak to Kim Jong-un. Former basketball player Dennis Rodman wants President Donald Trump to give him a chance to talk with North Korean leader Kim Jong-un. Rodman told The Guardian he's been asking Trump to talk to him for months and that he knows what Kim "wants more than anything." 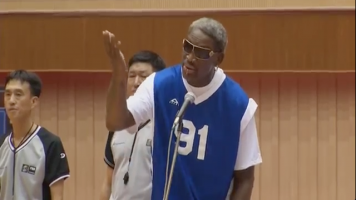 The request comes after Rodman was prevented from entering North Korea this week. Since Sept. 1, Americans have been banned from entering the country by the U.S. State Department. The visit was billed as a part of multi-country "peace mission" sponsored by PotCoin, a cryptocurrency that's meant to be used in legalized marijuana transactions. PotCoin also sponsored Rodman's trip to the country in June, when he said he was "trying to open a door." He said he's using what he calls "basketball diplomacy" to spread peace. The former Chicago Bulls and Detroit Pistons player has traveled to North Korea five times since 2013 and claims to be friends with the country's leader.